Hi everyone! This post is in replacement of a Christmas letter that we were thinking we would include with our cool card. 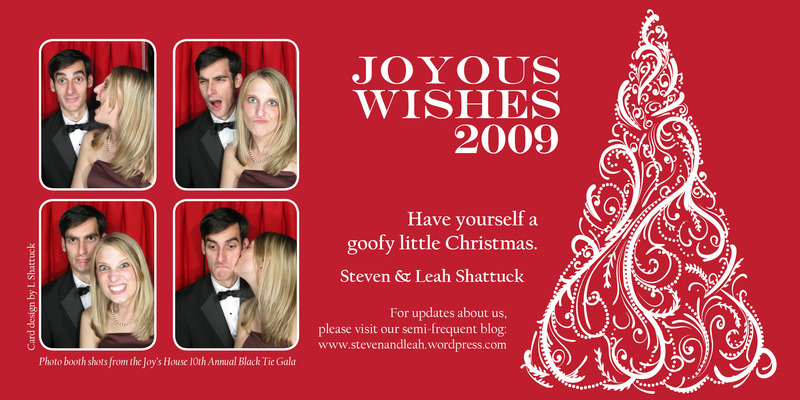 The photos on the card were taken at the Joy’s House 10th Annual Black Tie Gala in October (yes, in an old-fashioned photo booth!). Leah became Outreach Coordinator at Joy’s House in May, a not-for-profit adult day service that provides care for adults living with physical and mental challenges while providing respite for caregivers. She absolutely loves her new position, and gets to dabble in graphic design, marketing and event planning! Steven is continually producing successful short videos for organizations and local businesses at CMC Media Group. He has made many great relationships with churches, small businesses and hospitals this past year. We are both very blessed to work for such wonderful companies filled with amazing people! Leah is still singing on the praise team at Castleton Christian Church, and Steven has helped develop the web site and coordinate technical aspects of the Sunday service. This fall we’ve had the opportunity to house Leah’s cousin, Chris Ashbaugh (son of Keith & Dee), while he enters his first semester of grad school in music composition at Butler University. Leah has gotten used to have all boys in the house (including the animals!) – and it’s been fun to listen to his pieces of work come together into a beautiful arrangement. 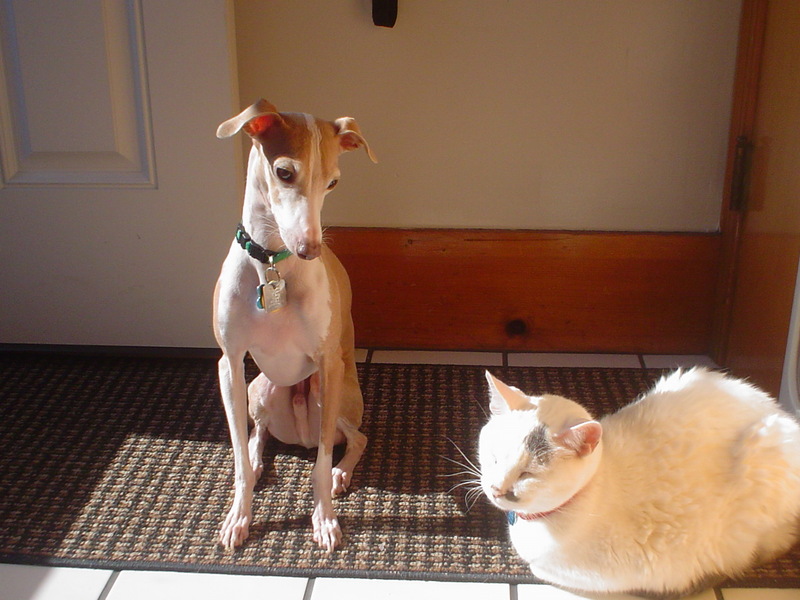 Jake, the Italian Greyhound, turns 4 this month. He is still getting used to having a brother, Desmond (aka Jack, aka “Kitty”), a 12-year-old white medium hair cat we adopted in February. They argue over who gets whose lap to snuggle in. This has been a growing year in many aspects. We have met many new, wonderful people in 2009, and it’s exciting to see our relationships grow and form. God has provided for us in ways we cannot begin to appropriately thank Him for! We hope all is well with you, and please continue to come back to our blog to check for updates in 2010. Have a Merry Christmas and Happy New Year!